When I first saw the title, I instantly thought of that song from The Fugees. Then I thought “Oh hey, that’s neat. I want to read this.” So yeah. The thought still stands: I want to read this. The cover does absolute wonders for me. It’s not overly interesting, but the soiled white rose does leave me pondering incessantly. Is that blood? Red paint? A questionably spilt wine? I also happen to enjoy the vines wrapped around the lettering. It’s simple, excluding that rose (the red liquid is a lot questionable)-it’s actually pretty sweet. You know what else is sweet? Fairytales. Which is exactly what this book promises. I don’t think Sarah Cross is giving it the typical Disney spin. I’m a total sucker for twisty fairytales and this looks like it’s mild on the twist. From what I could assume from the summary, the main character Mirabelle hasn’t taken on any well known happily ever after identity and I’m wondering what role she will play. All these words about curses and hidden pasts and destiny just gets my curiousity peaked to it’s highest. Will sixteen year old Mirabelle find her happily ever after, fairy tale fate? Or will she be cursed with a dark past as well as a darkened future? When I get my hands on it, I’ll be sure to let you know! 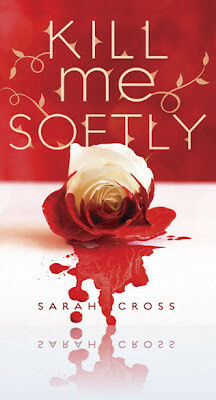 This entry was posted in 2012, Uncategorized and tagged Book Wish List, Books, Curiosity Corner, curiousity corner, Fantasy, Kill Me Softly, literature, Magic, Paranormal, Romance, Sarah Cross, Sasha, Young Adult by dreamingwithink. Bookmark the permalink.